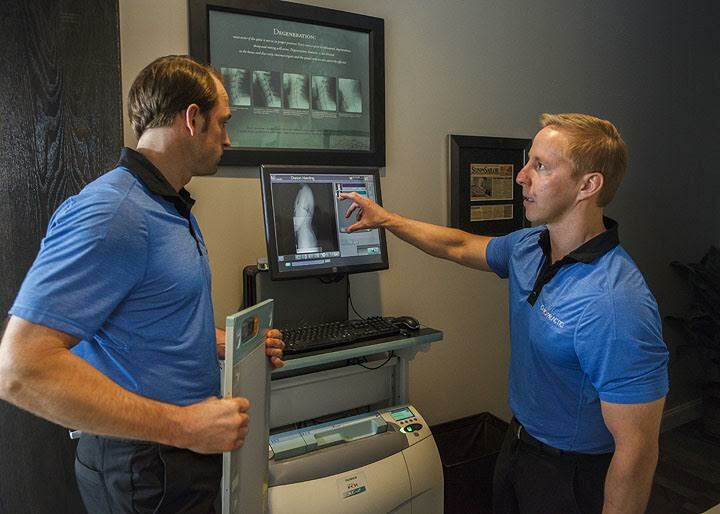 *At our office, we focus primarily on chiropractic adjustments and neuromuscular therapy. While we could offer more wellness services, we have found that our patients benefit the most when we direct our energy into the two things we do best. According to the Mayo Clinic, a chiropractic adjustment is "... a procedure in which trained specialists (chiropractors) use their hands or a small instrument to apply a controlled, sudden force to a spinal joint. The goal of chiropractic adjustment, also known as spinal manipulation, is to correct structural alignment and improve your body's physical function." Who should be getting chiropractic adjustments? Anybody can get a chiropractic adjustment, from newborn babies to senior citizens. Every single person experiences internal and external stresses on a daily basis. Stress takes a heavy toll on our bodies, creating imbalance and often times, discomfort. Chiropractic adjustments re-align the body so that our nervous system can function properly, our body can maximize healing, and we can filter stress accordingly. According to Wikipedia, neuromuscular therapy "...is an approach to soft tissue manual therapy in which quasi-static pressure is applied to soft tissue to stimulate skeletal striated muscle." Although similar to a spa massage, neuromuscular therapy will focus on the areas of discomfort or imbalance. This highly-localized approach helps restore range of motion and relieve discomfort. Who should be getting neuromuscular therapy? Similar to chiropractic adjustments, neuromusclar therapy is beneficial for nearly everyone, from children to seniors. What are some common reasons for seeing a chiropractor or muscular therapist? Some of the most common reasons for visiting a chiropractor or muscular therapist are suffering from back and neck pain, joint discomfort, headaches, ear infections, whiplash (car or work accident), repetitive injuries or strains, sport's injuries, and so much more. Because we look to improve the body's innate ability to heal itself, adjustments and neuromuscular therapy can help improve a whole host of issues. Some people simply want to improve their day-to-day functions even if they are not in pain. We call this "Wellness Care". With regular adjustments and/or muscular therapy, one can expect to stand and sit taller, improve their range of motion, prevent spinal degeneration, and maintain a healthy nervous system. We would be honored to help you in your health and wellness journey, no matter where you're at. To schedule a first appointment with us, please don't hesitate to call or email us.